Lichtimmissionen im Sinne des Bundes-Immissionsschutzgesetzes. Dissertation (english) von Christoph Röger, Verlag Dr. Kovač 2014, 204 S.
[...] Das Buch gibt wertvolle Hinweise zur rechtlichen Situation bei der Lichtimmission, die, über die Eingrenzung auf Stadionflutlichtanlagen hinaus, vielfach auch auf andere Beleuchtungsanlagen bezogen werden können. Es ist deshalb Errichtern und Betreibern von Beleuchtungsanlagen betreffs der rechtlichen Aussagen unbedingt zu empfehlen. Light immissions are harmful effects on the environment within the meaning of the Federal Immission Control Act (BImSchG), if they are liable to cause (among other effects) considerable nuisance to the general public or the neighbourhood. Immissions from artificial light sources can cause unwanted brightening of living spaces as well as deterioration or disturbance of visual function by glare. They can further affect animals and plants or cause brightening of the night sky (“light smog"). To this day, there are no formally binding threshold values defining the significance of light immissions. 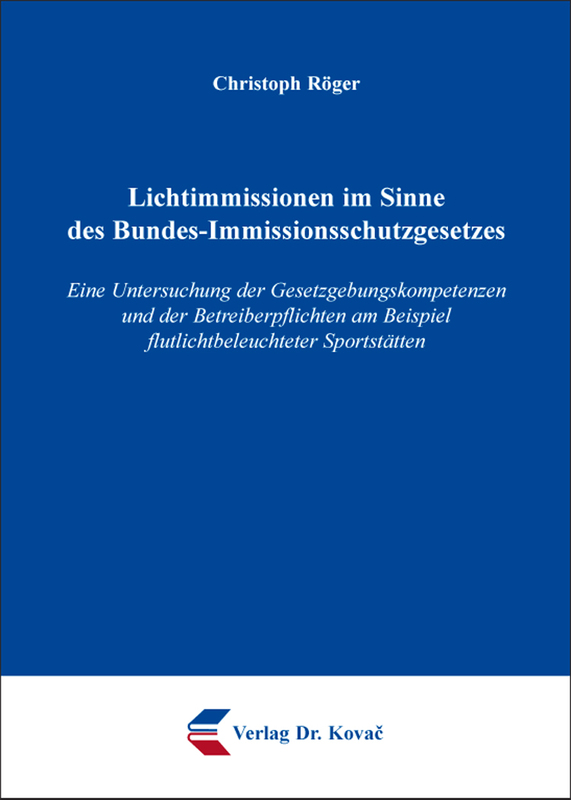 The “Bund/Länder-Arbeitsgemeinschaft für Immissionsschutz (LAI)”, a committee composed of members the responsible governmental departments, only provides a statement including "advice on the measurement and assessment of light immissions". Despite the practical and increasing relevance of light immissions, the jurisprudence so far only devoted little attention to the legal questions associated with this subject matter. Regarding constitutional provisions as well as federal and Bavarian statutes, this study closes a research gap. Starting with an outline of the evolution of legal protection against light immissions in the modern age, the study examines the foundations and the regulatory scope of the relevant federal provisions using the example of floodlit sports facilities. International guidelines and the requirements of European law are considered as well. The study focuses on the distribution of legal jurisdiction, an issue which up to this point has not been scrutinized by the jurisprudence. The study therefore also includes an examination of the legal history of the german federal constitutions as well as the german environmental law and considers the perceptions of the contemporary administrations. The result ultimately dictates a modified view of the relevant provisions of the Federal Immission Control Act. The study thereafter focuses on the examination and substantiation of the provisions in Art. 22 Section 1 Sentence 1 of the German Federal Immission Control Act regarding the obligations of operators of installations that emit light. It considers the significance of light immissions, the prevention of avoidable light immissions as well as the liability of light immissions to cause considerable nuisance.